Dr. Nicole Audet, or simply Dr. Nicole, has been publishing children’s books for nearly a decade. Her books are a breath of fresh air in children’s literature as her tales teach lessons on morals and medicine. A doctor by trade, Dr. Nicole has been working as a medical professional for over three decades. It is her work with children, as well as being a mother, that has inspired many of the books she has written. Dr. Nicole’s Felix & Booboo series has been her second most successful with fans around the globe. Her success has been sweet after being told by countless publishers that her books wouldn’t sell. Dr. Nicole took the publishers’ rejections in stride and has quietly proven the “experts” wrong. When Dr. Nicole isn’t writing or practicing medicine, she is teaching the next generation of doctors at McGill and Montreal University. The young doctors in training keep Dr. Nicole young while she gives back to the medical field. In 2019, Dr. Nicole will further her reach to young people when she gives a keynote speech and conducts a workshop during the 2019 Women’s Symposium at Sias International University in China. This annual event is organized by the Phoenix, Arizona-based nonprofit organization World Academy for the Future of Women. It attracts around 6,000 attendees from multiple China universities. Dr. Nicole recently took time out of her busy schedule to speak with Totalprestige Magazine about her careers in medicine and writing. Nicole, you are a renowned family doctor and children’s books author. Firstly, tell us how you got involved with writing and why you decided to become a doctor? I always wanted to be a doctor, and my journey as a writer began in correlation with my career as a family doctor. I was always fascinated with picture books, and the dream of becoming an author has always been tucked away in a safe place since childhood. After reading Dr. Jacques Ferron’s tales and novels, I knew I wanted to be an author as well as a doctor. My education and aspirations were dedicated to these two fields. My medical career has allowed me to complete my master’s degree in medical pedagogy, and later to teach family medicine at the University of Montreal and at McGill University. While avidly pursuing my medical career, I also wrote numerous medical articles and books and became Editor-in-Chief of the French Medical magazine. You have worked with families and children during your medical career. It influenced you to write children’s books. When did you decide that writing children’s books was something you wanted to pursue? The bridge to writing children’s books was built with a strong foundation during my medical writing endeavors. 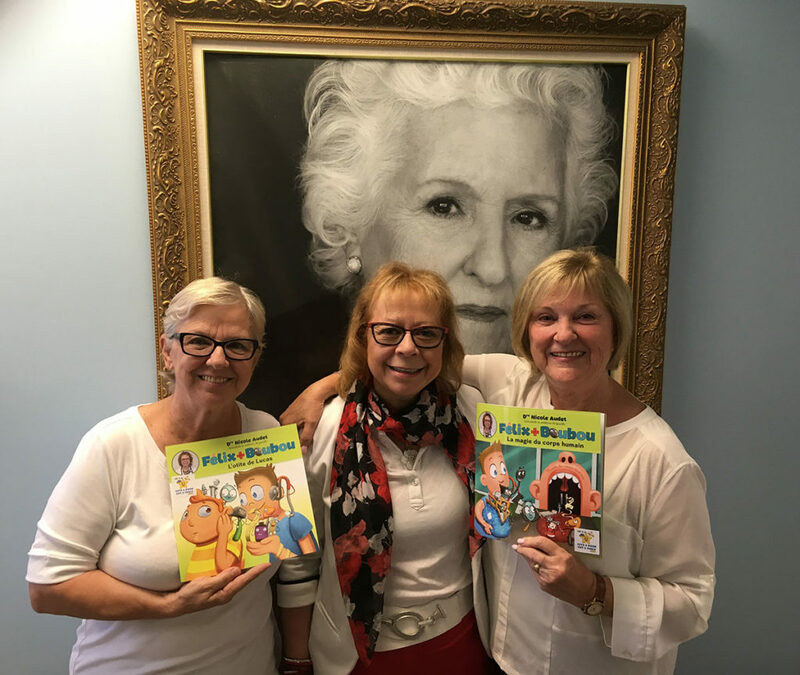 My mother loved reading children’s books to me and when I started to write for children using my medical background, she also loved reading my stories. Being a mother myself, my family grew up with children’s literature; we enjoyed many adventures together while reading and we learned a lot through the stories. Reading with your children fosters quality time together as a family. It is an activity I want to promote as it is beneficial for the child and the parents. In addition, my being a doctor qualifies me to write about medical issues children often must deal with, and I do so in a manner that is fun and easy to understand, making my books educational as well as entertaining. The Felix & Booboo series is one of your most successful. Tell me about the series and what you hope children and families will get from it? In the tradition of Walt Disney, I breathe life into inanimate objects and wildly entertaining characters that engage children in powerful ways. Felix & Booboo are the two main characters in the series. Felix is a little boy who discovers his doctor toy bag is magical: all the instruments are alive! Booboo is the stethoscope. Once he discovers this, Felix goes on various adventures with Booboo and his other magical friends and finds himself in an array of different medical situations, such as an earache, lice, a rash, fear of visiting the doctor, a broken arm, and so on. What child has not faced this? Do children often fear a visit to the doctor? These issues are the focus of the Felix & Booboo adventures; each book includes a quiz to help parents and educators challenge reading skills, and to teach critical thinking to their children. Children are in the development stage and literature is key to positive development. Reading and writing are activities that promote the use of imagination, open the door to inspire children, parents and other adults, having fun and learning valuable lessons to help make better decisions. Through literacy, it is my mission to guide children with positive messages that promote responsible behavior. I believe one of life’s most valuable lessons for parents is to teach children the importance of reading and to help them understand and appreciate its value. Simply put: it is critical for parents to encourage their children to read as much as possible. Through the parent/child interaction, my books boost the love for reading while helping children develop the most important skill of all: critical thinking. If a child can master the art of critical thinking, most everything else falls into place. My mission is to change the world one young reader at a time through reading. Each book is available in French and in English, in paperback, ePUB, Kindle and PDF formats. They may all be used by educators and medical professionals to help children understand that these types of conditions are normal and are not to be feared. All have received Reader’s Favorite 5 stars reviews. What can parents and children expect from “Parents for Sale”, another book that has won multiple awards? I self-published Parents for Sale in 2015. The storyline was inspired by my own experience as a mother of young children who had a dog but were not carrying their share of responsibility. One day, I told them I was going to put the dog up for sale. This decision broke their hearts and they begged me to change my mind. With new, good behavior they resolved the issue, and we did not have to sell the dog. Parents for Sale offers children this same concept with four important lessons about values, responsibility and life. The story features a set of twins who own a dog named Pistachio, but they are not taking care of it. This lack of responsibility causes stress on the parents who decide to sell the animal. Very unhappy with this plan, the children decide to sell their parents instead. A wicked witch disguised as a fairy offers to buy the parents and the children accept the offer. The fairy then transforms back into a wicked witch wishing to cook stew using the parents as the main ingredient, and the twins realize theirs was not a good decision. To find out if the twins can save their parents, you must read, Parents for Sale. The first and most important lesson in this book is the emphasis on the importance of children taking on their share of responsibility for pet care. The second lesson is to consider the possible consequences of wishes and choices made. The third lesson is to be careful when dealing with strangers. Lastly, the lesson to maintain a high level of morality and family value. Many are quick to think in anger, but it is better to remain calm and attempt to make sound and well thought out decisions. Parents for Sale received seven book awards or honorable mentions and was also published in 2018 as a coloring book with black and white illustrations. An audiobook version of Parents for Sale read by three professional actors is also available. Are you working on a new writing project at the moment? I have many projects on my desk. For example, a series of board books for toddlers that address common problems such as weaning a child off a pacifier, potty training or first days at daycare. A two-years old boy, his monkey and his father are the main characters. It is very unusual for fathers to be main characters in children’s books. I also plan to write a book to support my conference on 0 to 9-year-old child development; and a second edition of my bestselling health guide could become very successful following the 130,000 copies of this color illustrated reference book sold through my publisher, Guy Saint-Jean Éditeur. You have stated you always wanted to be an author and a doctor. How are you able to accomplish both so successfully? I have been a doctor for over three decades. As I writer, I first won a writing contest when I was at Sherbrooke University. My article on facial palsy was published in a medical magazine. Then, I wrote many medical books and scientific papers on clinical epidemiology. I loved being the Editor-in-Chief of a medical magazine! I learned everything I needed to learn on publishing to realize my dream to publish children chapter books and picture books. One day, during a period of career reflection, I was writing and drawing a picture book at the beauty salon. My hairdresser introduced me to the president of a well-established publishing company who asked me to come to her office the next week. That’s where the story started. Two years later, my French best-selling book was published as well as the first two books of the Felix & Booboo series. In April 2012, I attended my first book signing at the Quebec International Book Fair, In Quebec City where I was born. From that point on, I never stopped writing and publishing, there is always a story in my head eager to be written. Then in 2015, I met my agent Danielle Hampson, an American who speaks multiple languages including French, which makes things easier for me. At that time, my Felix & Booboo series was available only in French and she insisted I translate and publish the entire series in English. We work very closely together to promote my pen name Dr. Nicole and my books, especially in the USA and overseas. Your books teach values and responsibilities to children. Is there a lack of children’s books teaching meaningful lessons to kids these days? Most children’s books on health and diseases target middle-grade readers. My Felix & Booboo series educates, inspires and entertains much younger children. Yes, there are many children’s books on the market, but millions of parents and teachers are looking specifically for the kind of books I write. Most authors wish to teach meaningful lessons; being a family doctor gives me an edge as I know all about kids’ questions and fears about their body and diseases. My books answer their questions. On the other hand, I have also written books just for fun. I self-published a bilingual picture book Strike at Charles’ Farm/Grève à la ferme de Charles, after being inspired by a child’s question about a nurses’ strike. In this story I imagine farm animals on strike. The illustrations drawn by my illustrator Mylène Villeneuve are hilarious, and the message on responsibilities is easy to understand. Since I like the idea of bilingual picture books, I wrote a second one, Are You Eating My Lunch?/Manges-tu mon lunch ? dedicated to my youngest grandchild born deaf and suffering from congenital facial palsy. Kathy Kerber illustrated this award-winner book. Since he cannot hear, I wanted to inspire him to read. I wanted to write the best book I could for him. He was so happy to have his name in a book. It was a fabulous emotional experience for both of us! These two bilingual books won the 2016 gold and silver medals at the Literary Classic Book Award. Are You Eating My Lunch? was voted the Best First Picture Book, quite an honor! I have also been featured in Chicken Soup for the Soul of Quebecers and the Canadian Medical magazine with my stories and articles regarding health, including Tears Test, The Power of Listening and Accomplice to the Last Breath. This last one is a very special article I hold dear to my heart because it is about my stepdaughter’s last night prior to her dying of lung cancer. Nicole, you are also a lecturer at McGill University in Montreal in the Department of Pediatrics and at Montreal University in the Department of Family Medicine. Is it important to give back to the next generation of doctors? I have been teaching medicine for more than 20 years, it keeps me young. Working with well-trained students is also always a lesson in humility as they are up to date on the latest medical advancements. However, they don’t have the experience yet. It is a win-win for both teachers and students. What is a day in your like like? I have always been a hard worker. I get up early and after seven or eight hours seeing young patients, I go to the gym to exercise. Then, after dinner, I work for my publishing company. Depending on the season, I golf or ski on my days off. I like to be surprised by children’s questions and answers. Their assumptions can make you laugh! For example, in my office for an annual check-up a child once asked me to tell her where her body was hurting. For her, coming to visit the doctor meant having pain somewhere and she could not figure out where the pain was, because she felt none. I am afraid of fire. Years ago I had a serious car accident that killed my mother-in-law. I was in a coma with my two sons in their car seats crying while the car was burning. A truck driver saved our lives. Even 30 years later, I remain fearful of fire and having another car accident. Nicole, do you have any hobbies? I am very active. A few years ago, I played curling. Our team won one gold medal and two silver medals. I loved this team sport of strategy! I also love golfing and skiing, even if I will never quit my job to compete in those sports. Which historical figure do you most admire? What are you never without? I could never live without my computer! In 1982, my husband bought me my first McIntosh. It became my third hand. You can do everything with a computer! For me, this machine was magic then, and remains magical today. Can you share two of your favorite quotes with us? If you had the power to change just one thing in the world what would it be? I would give access to free education to all the children. Some must walk miles to go to school. Others don’t have up-to-date books to learn. In Quebec, I give books to the foundation of Celine Dion’s mother “Maman Dion”, as she is referred to. Each year this foundation gives school supplies to more than 1,000 poor children. In 2016 Maman Dion selected me as one of the 10 most inspirational women in the province of Quebec. This recognition has been the most significant event in my career. My true intentions regarding being an author are to inspire children to read, to set their imagination free and to encourage good decision-making regarding health, safety and moral responsibility. I want children to be able to inspire others to contribute to society. Writing children’s books, is for me, a way to give back and be a positive source to the community. It enables me to express myself in a positive manner while having some fun, and at the same time to be a good role model for both children and parents. These may be just a few small steps to make the world a better place, but they are important ones. I am honored to have my dreams become reality, and I will continue to work and create stories for children that motivate and inspire. My message to young authors and all indie authors is to dream big, to keep focusing and to hire experts to edit and market their books and their name. For more information on Dr. Nicole, please visit her websites DrNicoleBooks.com and FelixAndBooboo.com. Or to purchase one of her books, please go to Payhip.com/drnicole or http://amazon.com/author/drnicole.